Created by Steven M Greer, M.D. who brought you SIRIUS and UNACKNOWLEDGED! Click on any number below to donate by credit card or PayPal. Help create and promote the most important documentary of our time! Digital download of the book: "Hidden Truth – Forbidden Knowledge"
2 tickets to the Premiere with VIP seating. 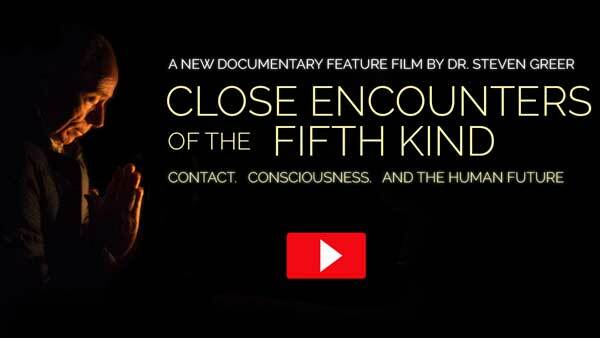 The film is intended to reach millions of people with the vision and knowledge of open Contact with extraterrestrial civilizations that are awaiting humanity&apos;s peaceful response to their presence. CE-5 (A close encounter of the fifth kind) is how this interface can be explored to make human‐initiated, peaceful contact with ETs. CE-5 contact techniques and show the amazing evidence of Contact as never before! the consistent results that people doing CE-5 experience. the connection between consciousness and space, time and matter. the nature of consciousness as an unbounded field of awareness that transcends the limits of space, time and matter — and yet is fully present in every point of space and time. This infinite field of consciousness is present within every awake, sentient being — human and ET. how ET electromagnetic communications systems interface with our consciousness and coherent thought in such a way that any human with a peaceful, sincere intent can make Contact. NOW! remote viewing — a way to view non-local events. scientific evidence that proves that Mind-Consciousness is not limited to your body or brain but is a seamless field of awareness that connects all times, places and matter. how 1% of the population meditating and making peaceful contact can cause a "phase transition" shift that transforms the entire planet and moves humanity onto a peaceful future that is Interstellar. and take you behind the "Alien Mask" of deceptive events and phenomena. how deceptive events are created by shadowy Unacknowledged Special Access Projects in the military and intelligence community that are designed to sow fear and division among humans regarding the ET presence. Only the truth will set us free from the lies and deceit! The deeper truth will be presented so that 1% of humanity — that critical mass needed to shift humanity — is reached. At that point, humanity and the Earth will transform into a world of peace and enlightenment unrecognizable from the world of today. THIS is the ultimate Disclosure Event: millions of humans making CE-5 peaceful contact, manifesting such intent and power that it overwhelms the suppression and deception that has kept UFOs and ETs secret for decades. All of us uniting together can create a force of peace that shifts the destiny of humanity away from endless war and destruction into a time of Universal Peace and Enlightenment. We invite YOU to become a part of history and support this historic undertaking. The more funds we can raise, the more we can to do to create the best ground-breaking film possible. Let’s reach 75 million people — 1% of the earth’s population, to unite and create an Enlightened future that is peaceful, conscious and sustainable! Please join us today! Thank you for your help and thank you for being part of CE-5! CE-5, or a "close encounter of the fifth kind" — broadly defined as human initiated extraterrestrial contact. Defined by Dr. Steven Greer, CE-5 is actually a prototype hybrid project which has scientific research and diplomatic inter-species relations components. In this UFO event, it is humans who are initiating peaceful, bilateral contact with the ETs through conscious, voluntary and proactive cooperative communication. If I make more than one donation can I qualify for higher gift levels? Yes — your total donations at the end of the crowdfunding campaign will be used to determine your gift level. When will the gift downloads be available? We will be adding a "My Gifts" section to this site where you will be able to download your gifts. We expect this new section of the site to be available in May, and some downloads will be available immediately at that time. Others, like the movie poster, will be available closer to the films release in the Fall. Funds will be used for the films production, marketing and distribution. Will my participation really change the world? YES! And when 1% of the world’s population begins to understand the truth, we will change humanity's and the earths future. * Views of the film and downloads to own are made available by the films distributor, The Orchard, and are not under our control. ** Where a gift level includes advanced notifications of events with Dr. Greer, such notifications will be for workshops, week long expeditions, etc. and will continue for 1 year after the films Premiere. © Copyright 2019. Sirius Disclosure. All rights reserved.